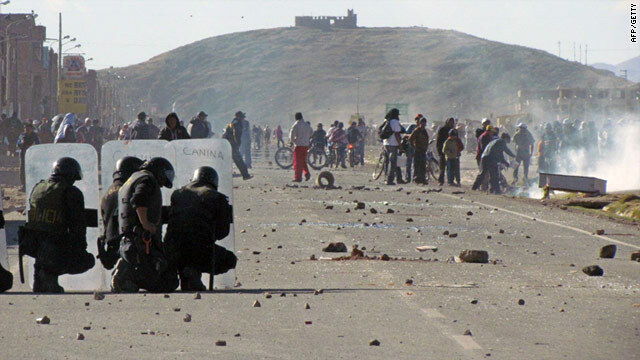 Protesters confront anti-riot near Juliaca in the Puno region on Friday -- five people died in the clashes. (CNN) -- Peruvian President Alan Garcia said Saturday that "dark political interests" were responsible for the recent deadly outbreak of violence in the southern department of Puno. "What they are looking to do is pressure the next government of President (Ollanta) Humala," the outgoing president told reporters. "There are dark political interests here that are demanding power." Humala, elected this month, is scheduled to take office on July 28. Garcia spoke the same day the Peruvian government agreed to put an end to a private mining project in Puno, following the deaths of five protesters in clashes with police on Friday. The decision followed more than 10 hours of talks between government ministers and indigenous Aymara leaders as the two sides tried to put an end to an indefinite strike that has gripped Puno for a month. The protests are against mining and drilling concessions in the region. On Saturday, a repeal of a 2007 decree that gave permission for the silver mine in Puno was officially repealed. As a result, operations at the Santa Ana mine, owned by the Canadian Bear Creek Mining Corporation, were canceled. Also, the deal gives local indigenous communities the power to approve or deny any mining or drilling operations in the area. "If the communities don't want mining, it can't be forced," said Fernando Gala, vice minister of mines. The agreement could also affect existing concessions in Puno, he said. The move comes after five people were killed and 25 injured in clashes with police as protesters tried to take over Manco Capac International Airport in the Puno city of Juliaca. "Sadly, these are human lives and we have to sympathize with what happened," said Cabinet chief Rosario Fernandez. She called for residents of Puno and two other areas where violent protests have taken hold -- Huancavelica and Huancayo -- to restore calm and assume an attitude of "democracy and dialogue." While she regretted the deaths of the protesters in Puno, she said the government would act as needed to restore peace. The mining of metals is one of Peru's leading industries, and a major revenue source for Peruvian departments with such natural resources. According to the mine ministry, Puno receives 700 million soles ($250 million) annually from the government, of which about 40% is from mining royalties. The canceling of the Santa Ana mine could cost Puno some 25 million soles ($9 million) in royalties, Gala said.